When you have a sunroom, less-than-ideal weather conditions can’t stop you from enjoying your surrounding landscape. 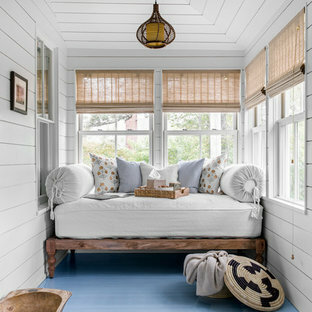 A step up from an exposed deck or patio, sunrooms provide shelter from rain, wind and bugs, extending the outdoor season — hence the term four season rooms. 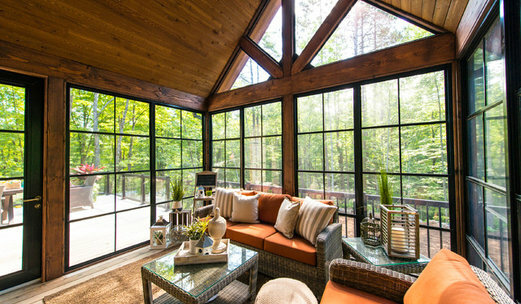 With plenty of sunroom ideas to draw inspiration from, it’s helpful to know some of the basics about these structures before you start your addition or remodel. What can I use my sunroom for? There are no limits when it comes to uses for a sunroom addition. Commonly, people take advantage of the plentiful sunlight and use them as informal conservatories or a garden room. If you don’t have a green thumb, you might use it as an additional indoor living space to relax and read, or create an indoor-outdoor feeling, like an enclosed patio or porch. You may also want to use the extra space as a playroom for little ones or a hangout for teens. Transform it into a separate dining area if you want to mimick al fresco dining year round. A combination of brick, cement and wood often make up the base, or “knee wall”, which supports the large windows. 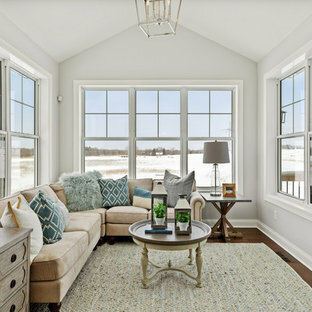 Clear insulated glass or storm windows are used for the majority of the walls — they allow the maximum amount of sunlight into the space while also trapping heat. With the close relative, screened-in porches, the glass might be replaced with window screens to allow for airflow in warmer climates. 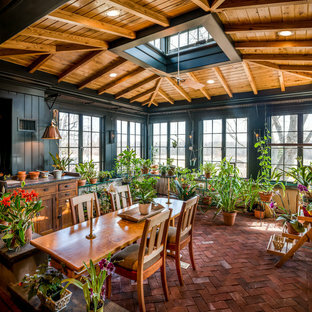 Check out plenty of pictures of sunrooms and pay close attention to how they are constructed to draw inspiration for your own. Roofing on sunroom designs can vary. Depending on the preference of the homeowner, the roof may be consistent with their conventional roofing, or could also be glass/plastic panels that let in lots of light. If you’re willing to pay a bit more, these panels are available with coating designed to reflect ultraviolet rays. Flooring in sunrooms was traditionally tiled to deal with possible leaks, but improved building methods allow for all types of flooring to be installed. 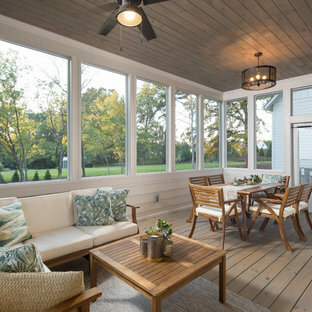 Browse different style sunroom ideas and see what catches your eye for each aspect of the space, since the material options are pretty wide open. 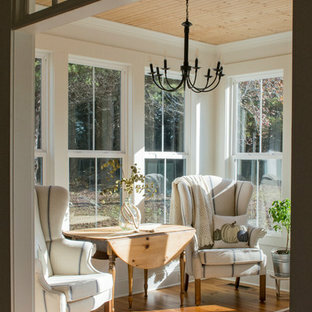 Chances are the decor and furniture in your sunroom design will see a high amount of direct sunlight. Keep this in mind when choosing pieces, since some fabrics and materials can quickly fade or become uncomfortably hot. Outdoor furniture will generally stand up well to the heat and light exposure of all-season rooms and patio enclosures, but don’t be afraid to mix and match with indoor pieces as well. Anything made from wicker or seagrass are good sunroom decorating ideas, while you might want to steer away from plastic or metal pieces. Installing shades or blinds is a smart way to prolong the life of your sunroom furniture and accessories when the space is not in use. 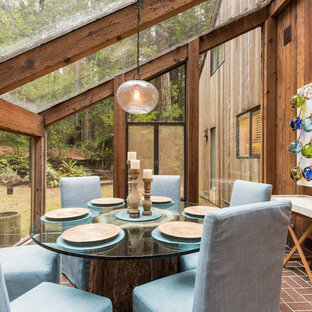 Whether you want inspiration for planning a sunroom remodel or are building a designer sunroom from scratch, Houzz has 45,498 pictures from the best designers, decorators, and architects in the country, including Steadfast Construction and River's Edge Landscapes. Look through photos in different colors and styles and when you find a design that inspires you, save it to an Ideabook or contact the Pro who made it happen to see what kind of sunroom design ideas they have for your home. 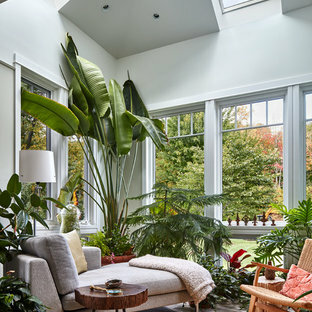 Explore the beautiful sunroom ideas photo gallery and find out exactly why Houzz is the best experience for home renovation and design.